Happy Halloween Weekend! 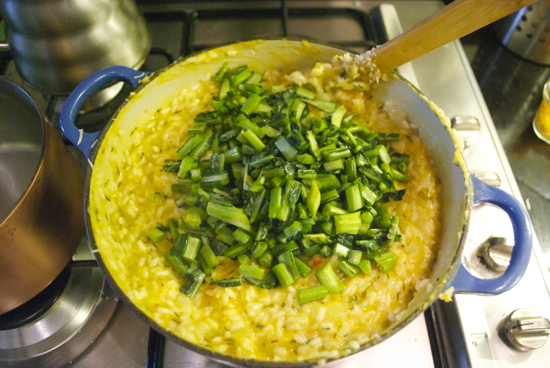 In honor of this wonderful Autumn, filled with beautiful yellows and oranges, I'm posting one of my favorite risotto dishes. 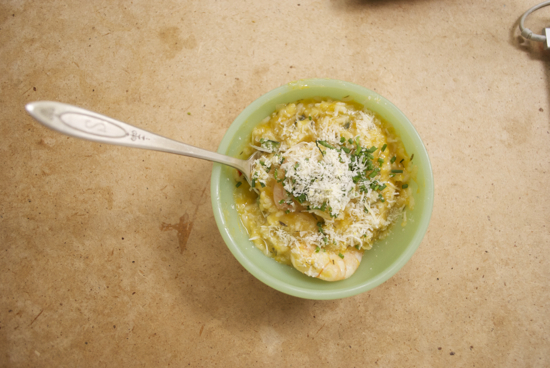 Risotto is not always a crowd favorite when it comes to home cooking, but if you've got a chilly Saturday afternoon to kill and your cozy kitchen is more enticing than the increasingly grey weather, I recommend you give this a try, you won't regret it. It's a great dish to add to your repertoire if you have someone you need to impress. 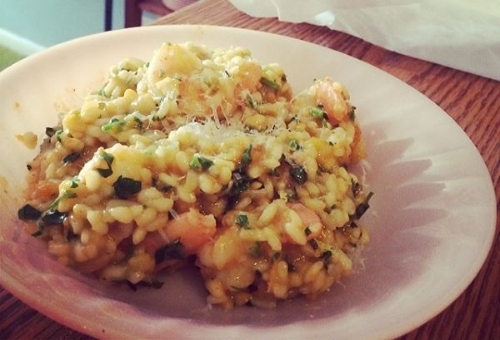 Risotto is actually quite simple, but it takes some elbow grease. Once the rice is in the pot, you just have to add one ladleful of broth every 10 minutes or so, and then give it a stir every 3-5 minutes. I save on labor here by roasting the butternut squash whole. 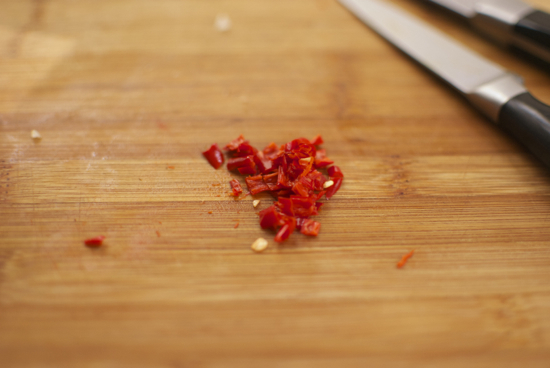 Once roasted the skin peels off easily and dicing it is a breeze. I keep half of the squash in cubed form, and then mash the other half into a smooth purée. The rest of it is a snap. 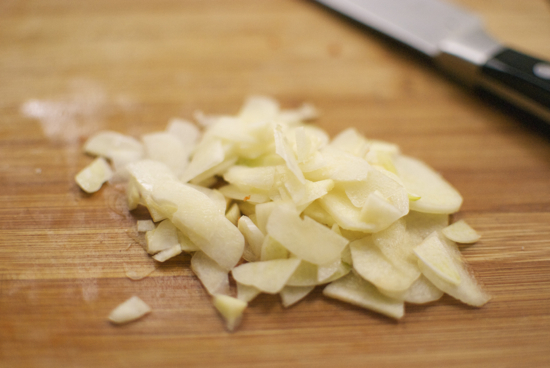 A quick sauté of some onion and garlic to start, add the shrimp in the last five minutes. 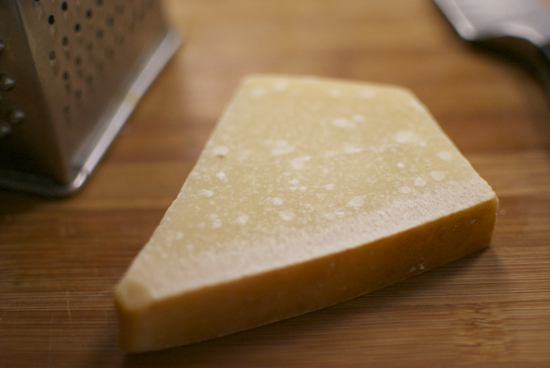 Finish off with a generous knob of butter, a snowfall of parmesan and lots of chopped flat parsley. In other good news, it's very difficult not to make a ton of Risotto, so once you've fed your masses, you can try your hand over the next week with Arancini, or Risotto Balls. I made Arancini with these leftovers and ate them so fast, I didn't have time to take pictures, but I'll try to capture them the next time. Roast the butternut squash whole for 30-40 minutes in an oven set to 175C or 350F. The squash is done when you can easily pierce it with a knife. Peel off the skin. Dice half the squash into cubes. 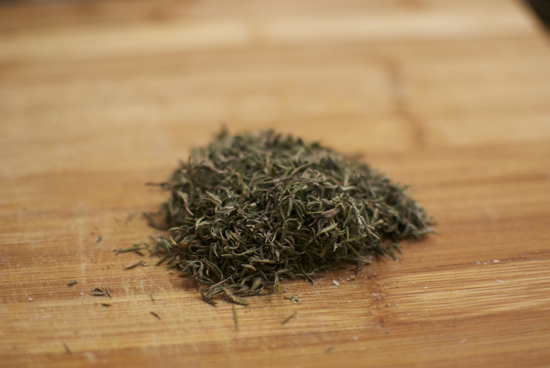 Clean out the botton side of seeds and pulp and mash the squash into a fine paste. Heat up the stock in a sauce pan. Heat up a glug of olive oil in a heavy bottom pan, like a dutch oven. 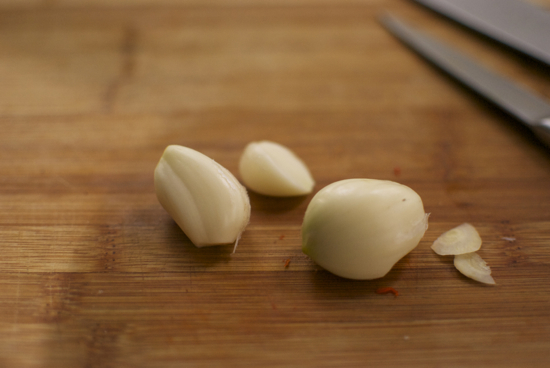 Add the onion, garlic, chili and herbs. Add a good pinch of salt. Sauté over low heat for 10 minutes. Keep the heat on low. 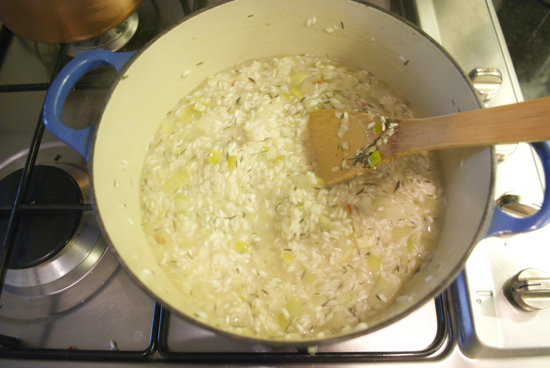 Add the rice, and give it a good stir, then add 2 ladles of stock, and stir in. Keep stirring every few minutes until the stock is absorbed. 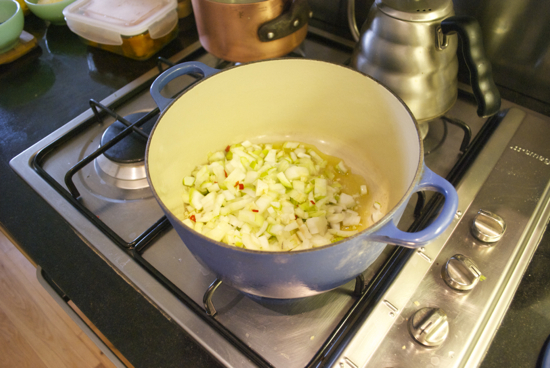 Then add another ladleful of broth. 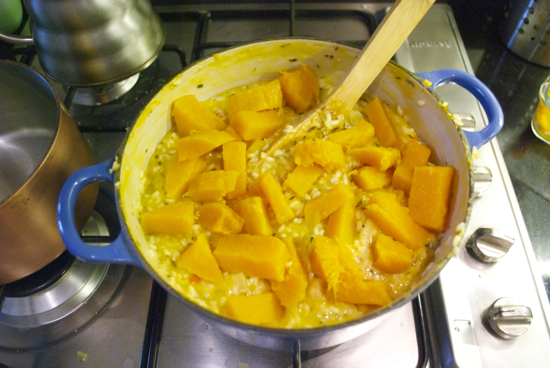 When stock is half gone (30 mins or so) add the squash purée and stir. 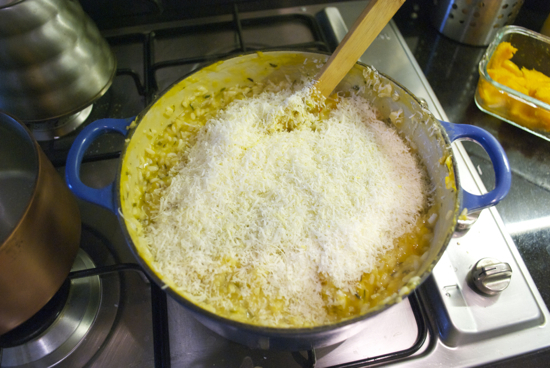 Just before the rice is nearly done, aka creamy, and the rice is no longer hard to the bite, but still al dente, add the cubed squash. 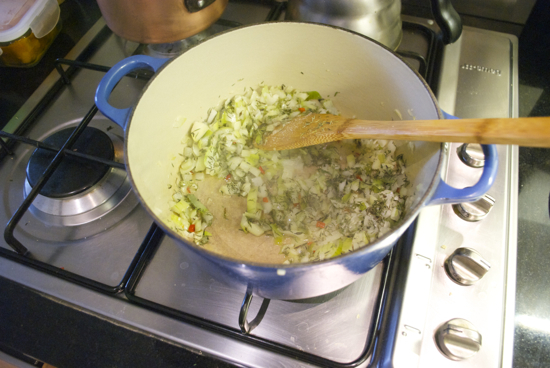 Add the last ladle of stock, and continue to stir. 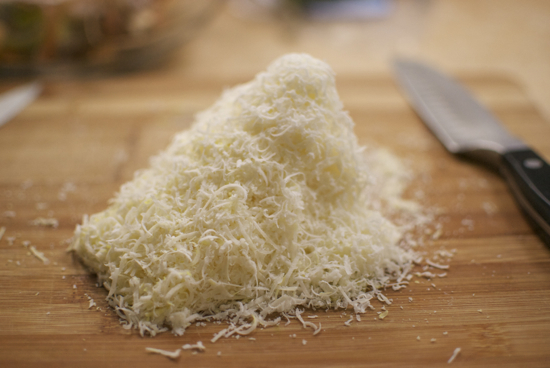 Add most of the cheese, keeping some for the table. Add the lemon juice. Give a good stir. Then add the shrimp. 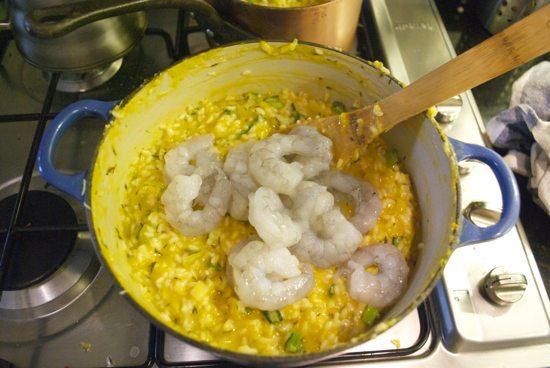 Incorporate them, and then cover, letting them cook in the heat of the Risotto. This should take about 5 minutes. Add the parsley last thing, and serve.